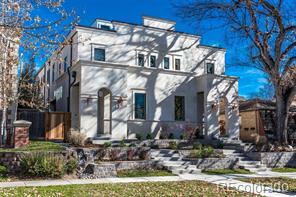 Stunning new construction built by Wiggs Custom Homes. Exceptional quality throughout including wide-plank European oak flooring. Fantastic flow in the modern chef's kitchen with top-of-the-line contemporary cabinets from Crystal Cabinetry, state of the art appliances from Miele and Pental Quartz countertops/slabs. Gracious master suite with spa-like bath, complete with radiant heated floors and steam shower. Open floor plan with large linear, direct-vent gas fireplace in great room. Spacious lower-level features additional bedroom suite, workout/bonus room and basement bar, complete with beverage cooler and dishwasher. Property is elevator ready. Roof-top patio with gas fireplace and mountain views - perfect for entertaining!